During this week, I will combine strength (running) workouts, longer tempos and my long run to start the most marathon specific training of my plan. Over the next few weeks, I will increase the length of the intervals in my strength workouts, get in longer mid week runs and increase the distance of my long run. I’m moving from the lactate threshold and endurance mesocycle (portion of training) to the race preparation mesocycle. This week you will learn about the importance of strength training for marathoners. 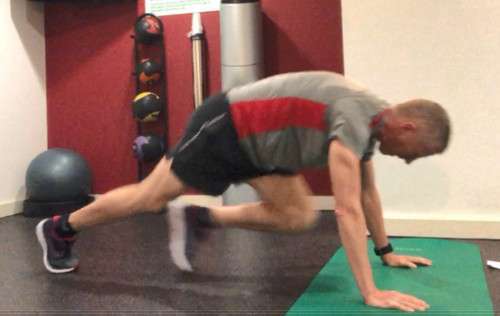 Strength training & conditioning exercises for runners should complement your training, not tire you out so you’re too sore and fatigued to run. Below you will also find links to some videos detailing workouts that I complete. I’ve broken the training into level 1 for those just beginning their strength training and level 2 for more advanced/experienced athletes. Here’s the link to my Strava Dashboard so you can see the details of each of my workouts. The purpose of this workout was to continue recovery from the Saturday’s 16 mile long run and also to include an easy/rest day prior to my Tuesday strength workout. This week I’m increasing the distance of the interval for my track workouts again. Now I’m up to 1.5 mile repeats at slightly faster than 10k pace (approx. 6:20/mile). 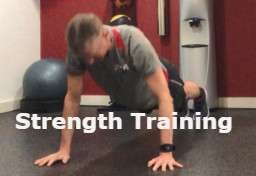 Last week I discussed the benefits of these strength workouts. The biggest benefit is that preparing my body to handle the fatigue that comes with marathon running. This workout is combined with a longer tempo and long run to give me the best marathon preparation possible. I like to keep the rest relatively short (in this case it’s about half the time of the interval) so I can really get my body used to dealing with some lactic acid accumulation. My times for each 2400m ranged were 9:34, 9:30 & 9:22 (I actually miscounted laps on the last interval and briefly stopped after 2000m, then I realized I was a lap short). I hit my goal pace (slightly faster than 10k) and actually felt good. Splits for my workout are below. 6 mile easy run. The purpose of this workout was to recover from yesterday’s track workout. I also have a hard/Tempo workout on Thursday, so keeping this run easy is essential to get the most benefit from my strength and tempo workouts. Today I completed a 45 minute “bike blast” cross training workout at the gym. It’s been 3 weeks since I completed this workout. Although I have been completing other conditioning/strength exercises, this workout is particularly useful because it combines rotating 1 minute on a stationary bike at a brisk pace with 1 minute of conditioning. It’s a great aerobic + strength workout. After the workout, I like to get a few miles in on a treadmill or outside. Today I completed 2 miles on treadmill. Strength training for runners won’t bulk you up and slow you down as long as you complete runner-specific training that emphasizes movements that directly correlate to running performance. Today’s conditioning exercises were both upper & lower body strength with barbells and my body weight. A few of the exercises with a shorter barbell and 20lbs of weights include squats, lunges, chest presses, arm curls and shoulder presses. The body weight exercises included push-ups, jump lunges, mountain climbers and various forms of planks and core exercises. Increased strength contributes to improved running in a number of ways. First, it helps to improve form when your fatigued. Strength training assists in preventing injuries because you have stronger muscles. Runners with better endurance can run longer. Stronger runners are able to recover faster from their long runs because strength training makes their bodies more efficient at converting metabolic waste into energy. The stronger you get, the more resilient your body will become to the demands of running. It’s important to remember that strength training should supplement your running. I like to keep my strength workouts short and fairly simple. I complete these bike blast classes every 2-3 weeks + the 15 minutes of conditioning exercises that I complete twice per week. These are beginner exercises that should be completed if you’re just starting conditioning exercises. It’s very important to start new runners or runners who aren’t accustomed to conditioning at an easier level. Also, I recommend starting with one session per week and work up to 2-3 and also including multiple sets of exercises per session as you get stronger. 10.7 miles at easy pace. Today’s run serves a dual purpose. I’m continuing to get time on my legs. Because I had some tough workouts (strength run on the track & tempo) this week and I had a long run the week before, the length of this run was only 10-12 miles. Many plans include slight increases in long run mileage every week. At the beginning of the plan, I do gradually increase my long runs week-to-week. However, during the harder, Marathon Preparation Mesocycle, I like my long runs of 15+ miles to be every other weekend. This helps me avoid injury. The purpose of this run was to recover from the previous day’s long run. The pace is easy.